A handy addition to any sacred space, and particularly useful for those without a lot of space for their altar tools, or who wish to bring their spirituality with them as they travel, this 6 inch by 6 inch altar table has been antiqued so as to appear aged and features the carved design of a triple moon upon its surface. 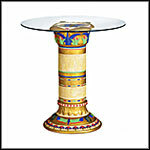 This small altar table is a fantastic supplement to your sacred space. Decorated with a Celtic styled pentagram, it not only provides you with an altar table for the focus of all of your rituals and spells, but offers storage space as well with a pull-out drawer. Our Drum Accent Table, 28" is 28" W x 18" H. Rosewood construction with a natural skin playing surface. Cord color and wood color may vary from photo. Actual weight is 40 pounds. Our Drum Accent Table, 24" with Beater is 24"W x 26"H. Rosewood construction with a natural skin playing surface. With one beater. Actual weight is 38 pounds. Cord color and wood color may vary from the photo. Crafted out of a single piece of wood so as to create a seamless, folding book holder, as beautiful as it is useful, this piece would make a wonderful addition to any altar, or indeed any kitchen counter! Perfect for the practitioner who travels or who has a need for a portable altar space, this 8 inch Altar Table has been carved with the likeness of the Greenman. Our Large Square Pentagram Altar Table is great for those without the space for a permanent altar or for those who otherwise wish to make their sacred space more portable, this 12 inch wide by 12 inch long and only 7.5 inches tall, this table easily fills both of those needs. Helping to both preserve the binding of your books and elevate them from the surface of your tables and altars, this wonderful device is a must have for anybody who spends long hours reading or pours over their books of shadow and other occult writings while they work their ritual craft. This small altar table, decorated with a complex image of the Tree of Life, encircled win a wide wreath of Celtic knots formed from its roots, is perfect for anyone who needs a portable surface. Our Small Square Pentagram Altar Table is intended to be used upon a larger altar table as a raised platform, or for those who have little space or need to be able to conceal their altar and ritual tools from those who may not approve of your practices, this small altar table is a fantastic creation. Providing either a portable altar space or a raised platform for elements within your sacred space, this altar table is a wonderful tool both for those seeking a space that they can conceal as well as for those who wish to enhance their more permanent altars. Hand carved of wood and antiqued to provide a dusky, aged appearance, this altar table is a wonderful display of craftsmanship and mysticism, with its display of the three points of a triquetra.